Imagine you are in the secured session (you are logged on and are authorized to access a particular resource), but your security infrastructure team has updated your rights and privileges. Perhaps you were given more rights and privileges or perhaps your rights were completely revoked… The problem is that your secured session is registered in session registry and until you log-off/log-on the Principal which represents you in this secured session will not be recreated. And what if the situation is even more dramatic (after all we are talking security here)… You are a disgruntled employe and your immediate management found out about your “wrong doings”, but it takes your company 5 meetings and 10 approval forms to get something done, and until that happens you are free to cause even more harm??? Obviously there are many business scenarios that could prompt for adjustment of user’s privileges while such user is in session. And again in Spring Security there are obviously more then one way of accomplishing this. One way would be kicking people out of the system by using the session registry (which is actually intended for concurrent session control). Building a GUI or JMX enabling this, one can “expire” a user from the list of registered sessions. The next request they make will be rejected and the session will be invalidated, forcing the process of Authentication. However to make it more interesting and also to demonstrate yet another way of accomplishing the similar goal let’s change scenario slightly and say that we don’t want to completely invalidate user’s secured session, but simply want to temporarily suspend it. Now, the word suspend in the context of security could mean a lot of different things. It could mean a temporary suspension or it could mean a total revocation of rights. I’ll leave it up to you to define the meaning of this word in whatever context… What I would rather do is to show you how secured session could be adjusted in real time using Spring Security components such as AccessDecisionVoter and AccessDesisionManager. Also in the following example we will adjust the current secured session by temporarily suspending user’s rights without invalidating his/hers session. To accomplish this we need to follow these steps. 2. Define and implement AccessDecisionVoter. This voter must maintain a list of users whose rights were revoked and must vote ACCESS_DENIED each time a user performs a secured operation. 3. Add this voter to the stack of voters already registered with AccessDecisionManager. Also, to be able to interact with this voter during the course of the application runtime let’s also JMX enable this voter by dynamically exporting it as JMX bean using Spring JMX. We are also going to put our custom voter first in the order of voter’s stack, knowing that in the Unanimous based decision making process the first NO means no further evaluation should be performed. Realizing that other voting decisions could be time consuming or performance intensive, registering custom voter first in voter stack will ensure that such voting operations are only performed if privileges are not suspended. The only thing left to do is JMX enable “suspendVoter”. This is easily done using Spring JMX . From the code perspective the only custom component we need to implement is SuspendRealTimeVoter class. In it, we will maintain a Set of users whose rights have been temporarily revoked. Inside of vote(..) method our logic is rather simple. If user is in the list, vote ACCESS_DENIED otherwise vote ACCESS_GRANTED. There you’ll also see suspend(String userName) and grant(String userName) methods via which we will test this functionality. When JConsole opens up click on MBeans tab. Navigate the tree and access SuspendRealTimeVoter. 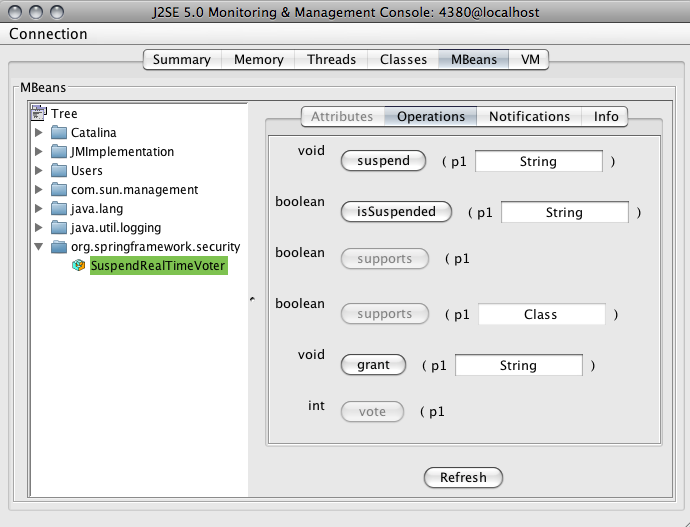 You will see that suspend(..) and grant(..) methods are available under Operations tab. Suspend the rights of the user you are logged on as and refresh HTML page you are on. You will be presented with denied.html page. Un-suspend the user by calling grant(..) method for that user and you are back in business. Now if it does take 5 meetings and 10 approval forms you can temporarily revoke the rights of the user giving your managers enough time to make such decisions. This was just one example demonstrating how secured session could be temporarily suspended using Voters. But I hope you can clearly see how the same approach could be used to accomplish other goals. Such goals could be re-authenticate user automatically or simply update the list of his/hers GrantedAuorities and so on.